Illegal fishing practices used in the seas off Kalpitiya have resulted in the death of more than 40 dolphins, investigations reveal. The dolphin casualties have sparked demands for a rigorous crackdown on banned fishing methods. Last week, Police arrested 14 fishermen and confiscated six boats and banned fishing equipment, including what is known as the “laila” fishing net. The Police were acting on a directive from the Fisheries Ministry based on complaints from members of the Kalpitiya fishing community. The “laila net” was the cause of the death of the 40 dolphins, Dr. Sayuru Samarasundara, chairman of the National Aquatic Research and Development Agency (NARA), told the Sunday Times. The laila net is a type of large ring net or purse seine net used to encircle large shoals of fish. It can be closed at the bottom to maximize the catch. This fishing practice has been condemned as destructive, as it entraps both large and small fish and can result in the elimination or extinction of a fish species in targeted fishing areas. 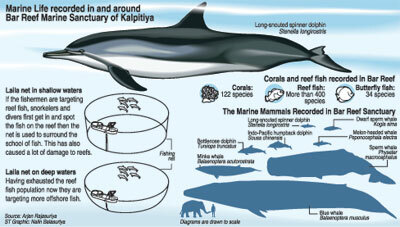 Dolphin groups are known to associate closely with tuna and related species such as skipjack tuna and bullet tuna. Because dolphins feed on small tuna-related fish, fishermen follow dolphin groups in order to locate high-value fish, explained NARA fish expert Dr. Rekha Maldeniya. A laila net operation involves the use of between five and six boats and a team of fishermen as well as divers and snorkellers. It is said that the force of the fish struggling to break through the net is so great that the fishermen use dynamite to kill or stun the fish. Dolphins are regular casualties of this fishing method. Kalpitiya sources say the destructive laila fishing method has been in use for some time, and that dolphins are a frequent by-catch. As dolphins are a prohibited catch, laila fishermen are careful to dump the dead dolphins at sea. Local sources say the dolphin carcasses are sometimes tied to sand bags and dropped so that they sink to the sea floor. 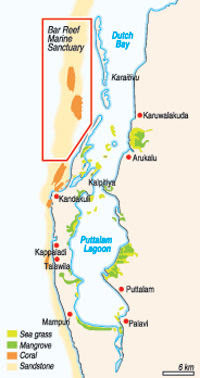 Marine biologists say laila nets are laid in close proximity to the Bar Reef Sanctuary, an important ecosystem in the Kalpitiya area. 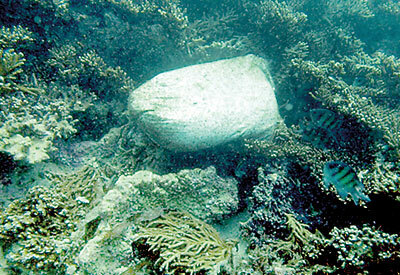 The Bar Reef was declared a sanctuary after extensive work conducted by NARA under environmentalist Arjan Rajasuriya. Mr. Rajasuriya said laila nets were not around at the time he was doing his Bar Reef research in 1989 and the early 1990s. The laila net came into use only in the late 1990s. Mr. Rajasuriya told the Sunday Times that the Bar Reef is one of the country’s most diverse marine habitats and requires protection. “But, sadly, all the larger fish are gone, and the destructive laila net is the chief culprit,” he said. The destructive impact of laila netting goes far beyond killing dolphins, Mr. Rajasuriya said. This form of fishing basically targets spawning aggregations of fish. Many species of fish, especially those that live in groups, come together seasonally to spawn. Jack (paraw), snapper (atissas) and barracuda (jeela) often aggregate in Kalpitiya waters days before the real spawning, travelling as a “large ball of fish.” One laila net is sufficient to wipe out whole colonies of these fish. Most of the larger fish are now gone, Mr. Rajasuriya said. Environment and wildlife activists are working with tour operators to push for the protection of the country’s marine resources. Kalpitiya Dolphin Watching is lucrative business. Tourists go to see the dolphins and the underwater corals. If dolphins continue to be killed and corals continue to be destroyed by dynamiting, tour operators will have little to show tourists. Tourism operators should be at the fore in action to protect the Kalpitiya ecosystem, Mr. Rajasuriya said. Laila netting is not a traditional fishing mode in Kalpitiya. According to locals, the laila was introduced by Mannar fishermen who were displaced during the war. �Although the war is over, the Mannar immigrants continue to operate on the northwest coast where the fishing grounds are much richer than on the east coast. Residents say the Mannar fishermen operating in the area have political backing. The indigent Kalpitiya fishing community is against the laila fishing mode, and has held several protests to demand preventive action. Back in 2004, Kalpitiya fishermen held a satyagraha to condemn laila net fishing. Another sit-in was staged two years ago in Kalpitiya town.�A catch made with a laila net can weigh up to 8,000 and 10,000 kilograms. To get such a large catch on board can take up to one hour, ample time for the authorities to conduct a raid on the operation. For now, however, the Department of Wildlife Conservation has no designated marine unit or even a boat to conduct a raid. The Sri Lanka Navy too has taken no action in regard to illegal laila net fishing. zUpali Mallikarachchi of the Marine and Coastal Resources Conservation Foundation says sustainable fishing methods should be strengthened and supported.